You can park directly in front of Fado Irish Pub by using the parking lot west of Wazee between 19th and 20th Streets. The Irish Snug will host Brian with Henry the Fiddler this Saturday night, October 23rd, at 8:30 pm. It's located at 1201 East Colfax Avenue, and we're looking to celebrate the inauguration of their new cabaret license! There's lots of new galleries, including shots from this month all around the Region. 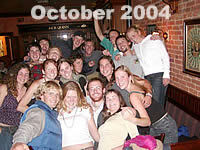 Click on the Colorado College revelers at right to go to that gallery at Irish Row. Or, you can select many of the galleries directly from this newsletter. Follow the film strip at left to any titled gallery that interests you. They are fast loading and you can view thumbnails on the same page as the photo appears. Place your cursor over the photo sequence at left for some commentary from Jack Quinn's. There's lots of photos to review and you're probably in more than one of them! We will be adding all of the rest of the galleries from the past year--or more--and putting them up on the web site for you to view, so check back often. What you've heard is true--everybody has been singing better at our shows lately, because we've got lots of new songs in the 92-page Irish Pub Songbook and plenty of books on hand for your enjoyment. Sponsored by Jameson and Guinness, these new books make an evening with Brian, Brendan and Henry a memorable experience. Join Brian and Brendan Clancy every Wednesday night at Colorado's premier Irish Pub in LODO Denver. There's a great menu, with full service until 10 pm, cold pints, the largest patio in the area, and a raucous crew of regulars make for a fun evening every time. Parking is available right in front of the pub on the Wazee Street entrance between 19th and 20th Streets. If it's Thursday Night , this must be Colorado Springs. Great food at reasonable prices and one of the best bar staffs in Colorado make for a remarkable evening as Brian appears at one of his very favorite Pubs. This pub offers the best atmosphere anywhere for great Irish music and fun. Brian is appearing at the Irish Snug on Saturday nights again, starting October 23, 2004. The pub is located at 1201 East Colfax on Capitol Hill. Join me as we get reaquainted with the locals and remember...this is one performance that you don't have to get up early the following morning! A full menu is available even late night, with drink specials and more. Here's a great new pub in Ft. Collins on Linden Street in Old Town. With good food and a terrific stage, Brian and Brendan Clancy are working on election night to bring you the results...of just how well they can sing up north! If you're in the area, be sure to join us...the first Tuesday of every month. This is strictly an opt-in newsletter. You can be promptly removed by clicking on the first icon at top left or here.